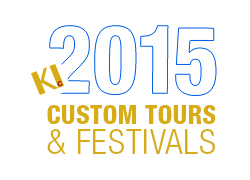 KI is proud to launch its 2015 programs! All of our favorite destinations in Europe, Asia and the Americas are featured in 2015. There is renewed interest in Greece and Northern Ireland as well as Peru and Argentina (tour in the footsteps of Pope Francis). Don’t forget the extraordinary India and that Australia is becoming more affordable through exchange rate changes. KI is so honored to have many of our beloved festival leaders return in 2015: Leck Italy, Stroope Barcelona, Breden France, Kennedy Austria, Dilworth Ireland, Hamre Greece. We proudly present Conlon in Monteverdi's Mantua & Venice and introduce Gentry in Italy. the participation of fully balanced choirs or groups of singers and their directors if the full choir cannot tour. Some hallmarks of KI touring include: individual billing at no extra cost, breathtaking venues, warm appreciative audiences, head office support all the way through till the tour’s conclusion, sensational local tour managers and touring/bussing/accommodation/food that is inviting, comfortable and safe! We look forward to discussing these and other options.